Ionic Women's Scrub Jacket —New! 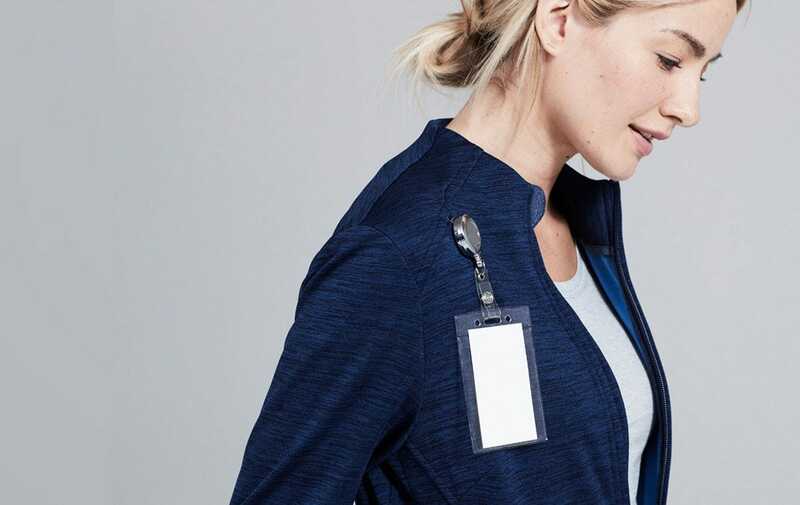 Sophisticated, athletic and fully functional, the Ionic jacket fits all body types to perfection. It's intentionally designed long for coverage and a slimming effect. Please be as descriptive as possible so we can try to find it in our archives. Free on orders over $175. Add custom text to your left chest (above pocket). If no colors available, please try re-selecting the product's color option above. NOTICE: You’ve exceeded the recommended embroidery characters for this product. Reduce your embroidery line and for the best results please stay under 0 characters including spaces. 2 reinforced, spacious mesh pockets provide easy access while maintaining a flattering silhouette. 3 zip-up security pockets, including a hidden pocket on the left sleeve. Seamlessly affix any badge clip in a clip pocket located by your shoulder seam. Breathable, bacteriostatic, moisture-wicking fabric with mesh back panel. The material is comfortable and seems like it will be durable, but still breathable. The pocket placement is really nice throughout the jacket too, especially on the arms. A clinical approach to new fabric and zero compromise attitude coupled with an iterative and relentless technical process with 100s of trials, allowed us to bring the ultimate stretch scrub fabric to you. Magnificently soft and durable with enough structure to keep you looking professional. The only 2-way stretch scrub fabric with the highest possible test rating in the industry...we've tested them all. That's why we back our stretch scrub fabric for women's scrub jackets with our one year warranty. With proper size the length of jacket should extend below hips as pictured. Center back length measures 29 inches in XS to 31.5inches in XXL. This may be my favorite jacket to wear over scrubs or even just for comfort! It's lightweight but still provides warmth, wicks away fluids & sweat- and I've received so many compliments on it already! LOVE IT! This jacket is my favorite. Washes well and is the perfect combination of sporty, professional, and functional. Not too toasty like a fleece jacket, just the right amount of warmth. Good sized pockets, can hold a stethoscope. For reference, I am 5’8” 145lbs and opted for the medium because I prefer a relaxed fit. I tried a small since I normally wear smalls in most scrubs and it was more snug, but still fit me in a functional way, so depends on how you like your jacket to fit. Either way would recommend 100% ! Love it !! My Jacket is exactly as described. I love the color and font of my embroidery, it’s done beautifully . I highly recommend it . I originally was going to get an athletic jacket/hoodie like Nike or North Face to wear at work (hospital), but I am so glad I got this scrub jacket instead. The fabric is amazing, even after several washes, the quality is still the same as it originally was. It keeps me warm in the freezing hospital and it has so many pockets! The pockets are huge! I can fit my stethoscope, and even my camelbak water bottle for when my hands are full. I especially love the little notch where I can put my badge in, I hate wearing my badge on my scrubs because it makes the neck sag. If you are looking for a jacket for work in a health care setting, it would make sense to get a jacket that was made for a health care provider!!! My boyfriend who is a physician also really liked this jacket and tried to take it from me, unfortunately it was a little too feminine for him! I get so many compliments on this jacket at work!!! I even wear this jacket on my days off. =] I am 5'3, 128 lbs and I have this jacket in a XS and theres still plenty of wiggle room. Modern cut is larger than most. Embroidery was small. I purchased the Ionic Scrub jacket about 6 weeks ago. I love the fit of the jacket. It lets me move easily, yet is very flattering. I’m always cold, and this jacket is so nice and warm without being bulky. The pockets are very big, and there are a couple smaller ones that zip closed for smaller items. My only criticism is that I wish one of the bigger pockets had a mesh insert so I could more easily keep my cell phone in it. My phone ends up at the back of the pocket which isn’t convenient. I highly recommend this jacket. Relief from the cold icy clinic! I bought this jacket to match my gray work scrubs and it has been a great relief from my icy over-air-conditioned clinic! It matches well and looks more professional than traditional scrub coats. Love the badge clip! Love this Jacket I wear it everyday! This jacket is the perfect fit! It does not over heat you but you’re not to cold cause we all know Medical offfices are freezing! It has amazing pockets and fits perfectly! I get so many compliments on this jacket as well! The back of the jacket is a little long and looks awkward. Pockets are large which is nice, but I think the mens version with zippers is so much better. Q: Does this jacket have a hood? Thank you for taking the time to ask a question. Our Women's Ionic Scrub Jacket does not have a hood. People love our Ionic Scrub Jackets. They are a fan favorite because of their comfy and athletic feel. Q: Will you ever produce this jacket in XXL? A: Hi Carole, thank you for your question. At this point in time, the XXL is not in production to be released but we have expanded the range in sizes in our scrubs and lab coats with high demand for alternative sizing. If they demand is great enough, that is size our design team will create. Q: What pants do you recommend to wear with the Ionic scrub jacket? TIA. Thank you for your interest in Medelita apparel. The Ionic Scrub jacket actually looks great on any of our scrub pants and even jeans. These jackets have been a great hit in the medical field and as a cover up jacket outside of work. With it's athletic fit but medical apparel features, this jacket has been a all day on the go jacket. Like all of our other items this jacket can be sent back for an exchange or refund if you feel this isn't for you. We do cover shipping costs for returns and exchanges on domestic shipments that are in the continental US. If you have any further questions, or need help placing your order please feel free to reach out to our Customer Experience team. Customer Experience hours are 8:00 am - 5:00 pm, PST at 877.987.7979.